Carb loading is an age-old technique used by athletes to top up their carbohydrate stores before a big practice session or race. Proper super-compensation of carbs can increase the stores in your muscles fairly dramatically… but at what cost? To answer this question, we need to look at the common processes for carbohydrate loading. In this process, the athlete is preparing for an event a full week in advance. For the first three days, the athlete is trading carbohydrates for more protein and fats in the diet. Many athletes go down to as low as 15-20% of their calories from carbohydrates. This forces the body to deplete the carb stores it has in the muscle and somewhat in the liver. After three days have passed in this environment, the body is essentially ready to super-compensate and store more carbs in the form of glycogen (glucose + water). For the next three day, a diet with ~70% of the calories coming from carbohydrates is eaten, allowing the body to super-compensate as much as 700-800 extra grams of glucose (depending on the athlete’s lean muscle mass). Since one gram of glucose attracts about 2.7 g of water, athletes can see weight increases of 5.7 lbs to 6.5 lbs. That’s a lot of weight to carry around on a mountain bike, jet-ski or motocross bike. In this process the the athlete is tapering off their training, focusing on the next race/event. Carbohydrates are maintained at a below normal percentage of calories around 40% for the first three days. The next three days then sees a jump to 65-70% of calories coming from carbohydrates, as the training tapers off, allowing more carbs to be stored in the muscle as glycogen. This will again result in significant weight gain. It’s easy to see that carb loading can really change the amount of weight you’re carting around on race day. Becoming super-compensated with carbs and water can also produce some other catastrophic events to happen. Carb loading is one of the main reasons why Action Sports athletes who use their grip (motocross, mountain bike, snow cross jet-ski, BMX, wakeboard etc.) get arm pump. The muscle in the forearm get so overcompensated with glycogen that when put to use, they accumulate more fluids, which changes the mechanics of the muscles causing them to contract very inefficiently. This destroys fine motor movements that are needed to hold on as well as pull in clutch and brake levers etc. A short-term accumulation of glycogen will also trigger your body to use it more readily which will alter blood sugar levels. 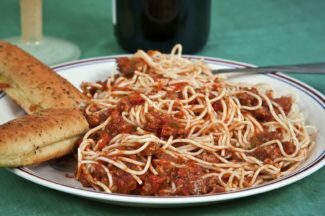 Eating the traditional pasta meal 3-5 hours before racing/training will literally set off a cascade of events that can backfire on you. When you ingest this meal, the hormone insulin is secreted to help the body in the process of storing the carbs. Insulin essentially helps to remove carbs from the blood stream and take them into storage. When this happens, the end result is low blood sugar. Low blood sugar brings on the feelings of being tired and unfocussed… exactly what you don’t want heading into a major training session or race! So you’ve just finished a full day of racing or hard training, and your body’s carbohydrate levels are at their lowest point. Your muscles are also damaged from the constant pounding, and they need to recover quickly during this critical window of time. It’s at this point, your body is absolutely primed to super-compensate carbohydrate stores. In simple terms it is ready to carb load with maximum efficiency and effectiveness starting with the post race/training meal. This should consist of anywhere between 50 and 70 g of carbohydrates with 3-6 g of Branched Chain Amino Acids (BCAAs) which can be found on our site. A very simple way to do this is to mix the BCAAs with the original Gatorade. This will immediately prime your physiology for maximum recovery. For the three days following, you should be consuming approximately 65% of your calories from carbohydrates. This will continue carbohydrate compensation, and give you energy to train during the week. The final three days before racing again you should have your carbohydrates at normal levels in your diet setting you up to have exceptional energy, full muscular recovery, decrease risk/severity of arm pump and ideal bodyweight for racing/competing. It’s a different approach than the traditional carb loading which can be disastrous, but once you’ve tried it for two weeks, you’ll never go back to your old protocol again. Race hard all day, immediately followed by 3-6g of BCAA powder with two servings of original Gatorade. Evening meal with 60-80 g of carbohydrates and 30-50 g of protein (depending on body weight). Drink four cups of water. Increased carbohydrates with every meal. Carbohydrates should make up approximately 65% of calories each meal. Drink 1 gallon of water (4 litres). Same a Monday and Tuesday. Lower carbohydrates to approximately 50% of your caloric intake. Raise lean protein levels to maintain calories. Same as Thursday and Friday.